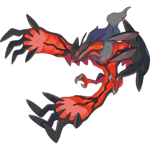 Yveltal is the seven-hundred-and-seventeenth Pokemon on the National Pokedex and was introduced in Generation 6 (X & Y and ORAS). Yveltal is a Dark/Flying type Pokemon. It is a Basic Pokemon that does not evolve. It is the title legendary of Pokemon Y version and is in a duo with Xerneas.